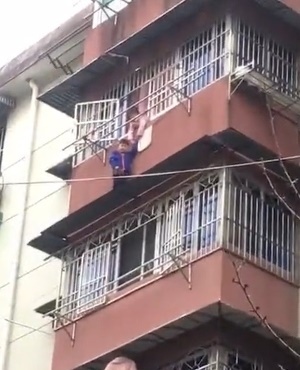 Footage showing an 8-year-old girl holding her 5-year-old brother's hand after he got stuck on a metal awning four storeys high, has emerged. The boy was trying to retrieve a shoe when he got stuck. The siblings, who were alone at home, were spotted by concerned neighbours in the city of Ningbo's Yinzhou district in East China. Local residents tried to gain entry to the house but found the front door bolted shut, so the police were called to help. Blankets and bed sheets were held out on the ground below by neighbours in case the boy fell from the awning four storeys up. His sister held his hand for about 20 minutes while waiting for the fire service to arrive. A video taken by neighbours shows the boy standing on the flimsy metal structure just 20cm wide, while his sister holds him tight, leaning out of their lounge window. The fire service broke open the door and pulled the children to safety shortly afterwards. According to reports the boy had thrown his shoe out of the window and climbed onto the awning to retrieve it, but couldn't get back inside again. The boy's father is said to have arrived home after the rescue, but it's unclear whether he was fined for leaving the minors unattended.